Paheli and Boojho were waiting for their dinner. Boojho lifted a stainless steel plate and saw his image in it. Oh! This plate acts as a plane mirror. My image is erect and is of the same size. Pahel saw her image using the back of a steel spoon. Boojho look here! I can also see my erect image though it is smaller in size. This spoon also acts as a mirror of some kind, said Pahel. You can also use a spoon or any curved shining surface to see your image. Take a stainless steel spoon. Bring the outer side of the spoon near your face and look into it. Do you see your image in it. Is this image different from what you see in a plane mirror? Is this image erect? Is the size of the image the same, smaller or larger? Now look at your image using the inner side of the spoon. This time you may find that your image is erect and larger in size. If you increase the distance of the spoon from your face, you may see your image inverted. You can also compare the image of your pen or pencil instead of your face. The curved shining surface of a spoon acts as a mirror. The most common example of a curved mirror is a spherical mirror. If the reflecting surface of a spherical mirror is concave, it is called a concave mirror. If the reflecting surface is convex, then it is a convex mirror. 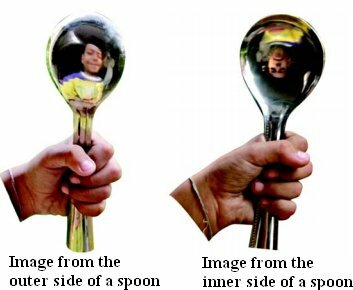 The inner surface of a spoon acts like a concave mirror, while its outer surface acts like a convex mirror. We know that the image of an object formed by a plane mirror cannot be obtained on a screen. Let us investigate if it is also true for the image formed by a concave mirror. Take a concave mirror. Hold it facing the sun. Try to get the light reflected by the mirror on a sheet of paper. Adjust the distance of the paper until you get a sharp bright spot on it . Hold the mirror and the sheet of paper steady for a few minutes. Does the paper start burning? This bright spot is, in fact, the image of the sun. Notice that this image is formed on a screen. An image formed on a screen is called a real image. Recollect that in an activity the image formed by a plane mirror could not be obtained on a screen. Such an image is called a virtual image. Now let us try to obtain on the screen the image of a candle flame formed by a concave mirror. Fix a concave mirror on a stand (any arrangement to keep the mirror steady would do) and place it on a table. Paste a piece of white paper on a cardboard sheet (say about 15cm-10cm). This will act as a screen. 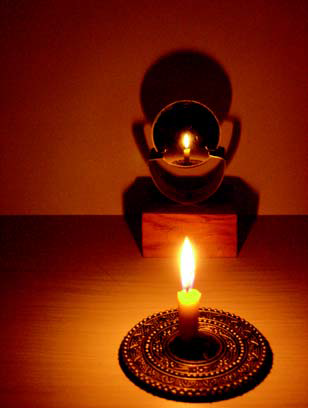 Keep a lighted candle on the table at a distance of about 50 cm from the mirror. Try to obtain the image of the flame on the screen. For this, move the screen till a sharp image of the flame is obtained. Make sure that, the screen does not obstruct the light from the candle falling on the mirror. Is this image real or virtual? Is it of the same size as the flame? 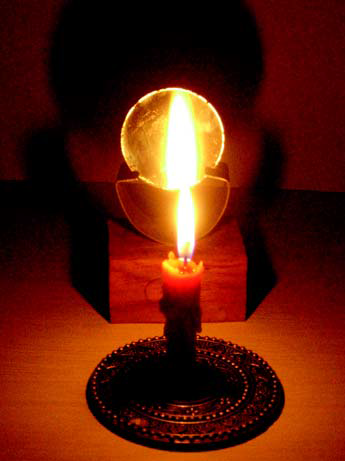 Now move the candle towards the mirror and place it at different distances from it. In each case try to obtain the image on the screen. Record your observation in Table Is it possible to obtain the image on the screen when the candle is too close to the mirror. We see that the image formed by a concave mirror can be smaller or larger in size than the object. The image may also be real or virtual. Concave mirrors are used for many purposes. You might have seen doctors using concave mirrors for examining eyes, ears, nose and throat. Concave mirrors are also used by dentists to see an enlarged image of the teeth . The reflectors of torches, headlights of cars and scooters are concave in shape. Boojho observed his image in the shiny surface of the bell on his new bicycle. He found that his image was erect and smaller in size. He wondered if the bell is also a kind of spherical mirror. Can you recognise the type of the mirror?Note that the reflecting surface of the bell is convex. Repeat the above now with a convex mirror in place of a concave mirror. Record your observations in a Table. Could you get a real image at any distance of the object from the convex mirror? Did you get an image larger in size than the object? Can you now recognise the mirrors used as side mirrors in scooters? These are convex mirrors. Convex mirrors can form images of objects spread over a large area. So, these help the drivers to see the traffic behind them.